The Dallas Cowboys know away games have been their Achilles' heel this season. Dallas have not won outside of AT&T Stadium yet, and have another road trip planned on Sunday – a week seven matchup at FedExField against Washington. 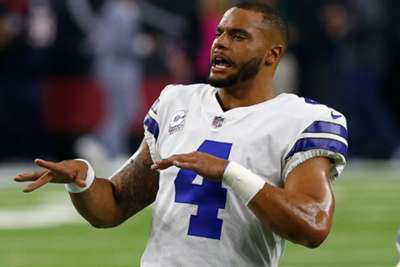 Quarterback Dak Prescott admitted the team have "addressed the elephant in the room", which is a struggling offense. The Cowboys have converted just nine-of-38 third downs through their first three road games and combined for 37 points against – two of those games were against opponents with losing records at the time, the Seattle Seahawks and Houston Texans. "We addressed the elephant in the room as an offense," Prescott said, via ESPN. "I think it was great. It was a great meeting. We had the whole offense in there and just talking among the coaches and players about the thing maybe we need to do better on the road, just communication. "I know we'll take a lot from that conversation and our communication will be better. We had a great day of practice and yesterday and just got to carry it over to Sunday." While the road seems to always bring its own challenges for Dallas, the Cowboys are coming off their most productive offensive game after a 40-7 win against the Jacksonville Jaguars. Dallas have not had two consecutive wins yet, and will hope to accomplish that against Washington but coach Jason Garrett knows overcoming their struggles on the road will not be easy. It is not only third downs that have plagued the team. The Cowboys have not scored more than 16 points on the road, and average a meagre 276 yards and 16 first downs. Protection has also been a problem, as 13 of Prescott's 19 sacks have come away from home. "It's a challenge that every team has every time the ball is snapped in the National Football League and making sure 11 guys are playing together," Garrett said. "And we'll continue to emphasise that with our football team."